Have been riding full suspension carbon mountain bikes for ages and forgot the pleasure of riding a true breed alloy hardtail. When Santa Cruz Bicycles launched the fully revamped Chameleon, the decision to get one was a no brainer. The trusted brand and life-time warranty are hard to beat. As the name Chameleon implied, you can run either 29, 27.5+ or single speed. The versatility allows you to hit the dirt, trails, urban, bikepacking, pump track and bike park...a truly all rounded machine. Besides, Chameleon is a perfect match for my Hightower, as I am able to interchange the 29er and 27.5+ wheelsets between the 2 bikes. Effectively, I got 4 different bike configurations! 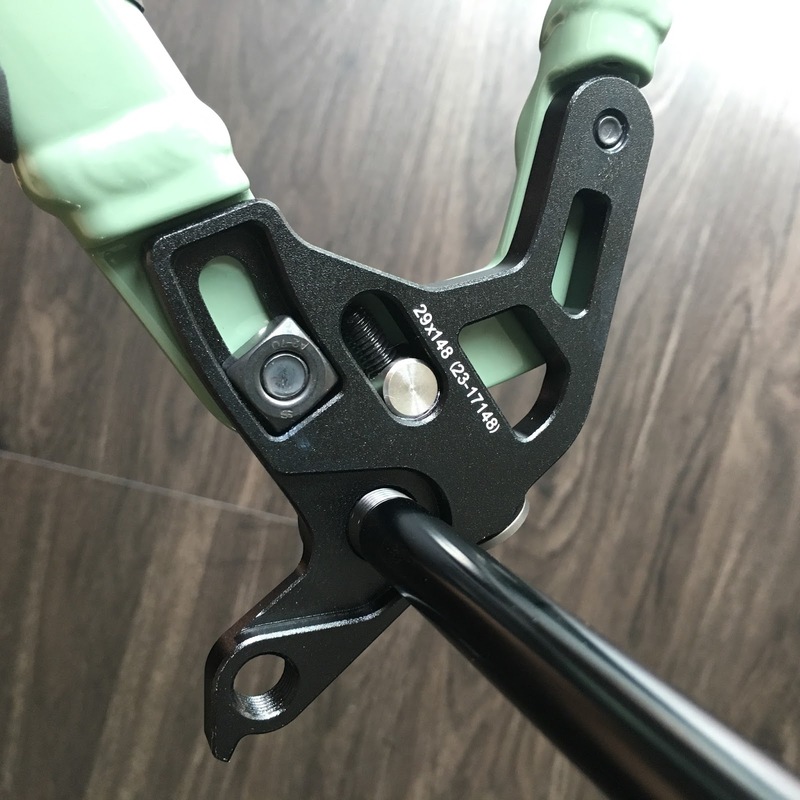 The design of the Chameleon dropout is ingenious. The dropout is adjustable to fit different wheel size. The standard size is boost 148 x 12. You can get an optional dropouts for 142 x 12 if you intend to keep your old wheelset, or to run single speed. The new Chameleon is designed with slack headtube and short chainstay length in mind. Depending on the fork and wheel size, the headtube angle should fall within 67 degree range and the chainstay length 16.35" with 15mm additional from adjustable dropout. At 120mm fork length, the BB height is 12.4". The recommended fork is between 120mm to 140mm. As you can see, the Chameleon geometry is the future. This Chameleon of mine is matched with 140mm Fox Performance Series fork with Chamo protector. 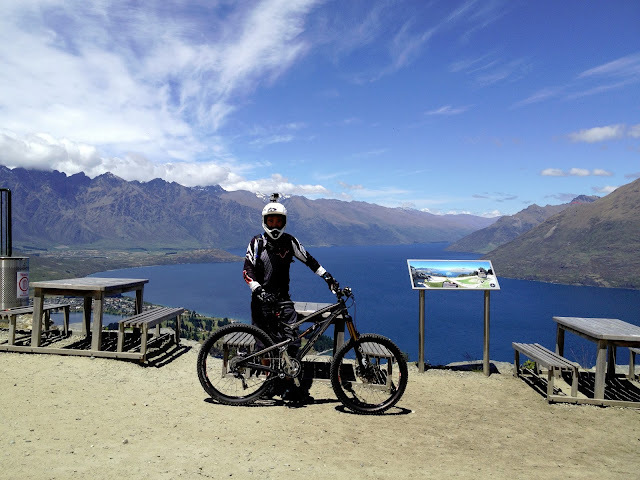 The intention to build a bomb proof hardtail was motivated by the plan to do bikepacking in my adopted home New Zealand. Cracked my rear carbon rim recently while bombing down an A-line and a double drop, would not want to risk bike failure again in the middle of nowhere. All the components used on Chameleon were intentionally alloy, and priority was given to toughness instead of weight. To further reinforced the spirit of Chameleon, stick the frame and fork with Chamo AMS protector. Well, bought a new 2018 Fox 160mm Factory Series fork for my Hightower and transferred the 2017 Fox 140mm Performance Series fork to the Chameleon. Removed the Hightower matching decals and stick on the AMS Camo protector. Wala! a brand new looking fork! Renthal stem and bar are one of the toughest you can get in the market. They are favorite choice by world class Enduro and DH riders. Got a spare 60mm Renthal stem and a used Deity alloy handlebar from my ex-Santa Cruz Nomad 2. Subsequently bought a Renthal Lite alloy handlebar 760mm. The perfect fit! Shimano disc brakes are the most reliable you can find in the market. All my rigs used Shimano brakes (XTR & XT) and they never fail. As Shimano just launched a 2 chambers brake version, I got the XT M8000 brakes at a steal. The adapters used are 180mm for rear and 203mm for front. 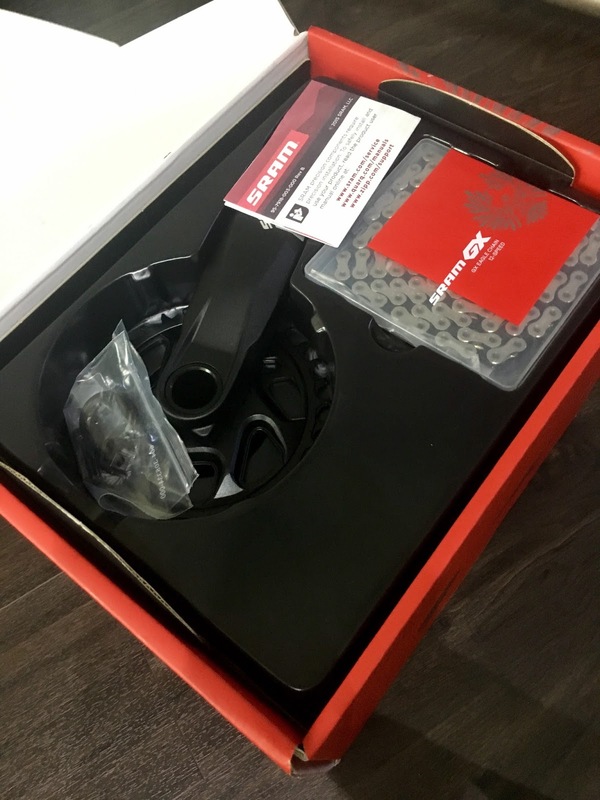 SRAM Eagle Groupset is the only option, as I am running X01 Eagle on Hightower, and intend to interchange the wheelsets with Chameleon. The more cost effective version is GX Eagle since light weight is the least of my concern for Chameleon. As usual, our local bike shops always late in the game and the wait time for the stock to arrive was perceptual without ETA. Waited one month without sign of arrival, finally got it from Carousel. Someone abandoned project and let go below cost. The gear shift during the first test ride was buttery smooth and spot-on. In fact, it was better than my X01 Eagle running on Hightower. Wonder if gear shift is more forgiving in hardtail. None of the local bike shops I approached sell direct mount chainguide. Got the OneUp direct mount chainguide from CRC online. It fit nicely on Chameleon. Replaced the stock GX chain ring with Absolute Black 34T Oval chain ring. The whole set up fit nicely although the gap between the frame and ring is pretty narrow. The crank is supported by a used but flawless SRAM threaded ceramic bottom bracket. One of the best wheelset you can get in the market relatively cheap is Stan NoTube Flow MK3 27.5 rims laced with Hope Pro4 hubs and run on 27.5 Nobby Nic 2.8 tyres. Pumped 2.2psi rear and 2.1psi front. These wheels just rolled over anything that comes along, and surprisingly grippy in high speed berm and cornering. Bombed down rocky gardens at high speed during first ride, passed the test without flat! awesome! Transferred the Performance Series Fox Transfer Dropper from my Hightower to the Chameleon. Although the 2017 dropper is not as fast and smooth as the new 2018 Fox Transfer Dropper Kashima version (fitted on Hightower), it does the job well. Recycled the Deity Alloy Handle bar that was kept in the storeroom for ages. It was previously used on my Nomad2. Bar length is sweetly at 760mm. The alloy bar helps to absorb the vibration on rough terrain, may not want to go back carbon bar in near future. This lizard took me one month to build, mainly spent time on waiting for components arrival. The last item to arrive as GX Eagle groupset, and it took another 3 days to build the wheelset. Fortunate to have Melvin from Tiong Hin to build my Chameleon, he is one of the best mechanics you can find in Singapore. Was told by few 'experienced' mechanics that AbsoluteBlack Oval Chainrings are not compatible with SRAM Eagle drive system. My mechanic Melvin proved them wrong, shifting the GX Eagle gear on 34T AB Oval Chainring is spot on and buttery smooth. Better than my X01 Eagle on Hightower. Did the usual ride at BT, Chestnut, T15 and the pump track. Rode the same way I did on Hightower. This lizard is fast, responsive and playful. 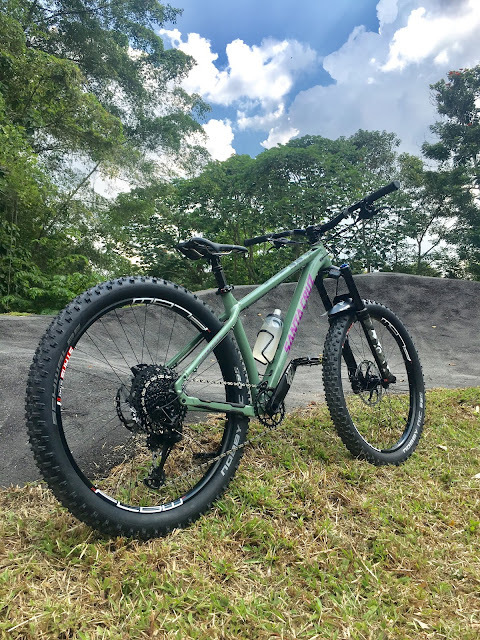 Although no longer I could hop and drop like I used to on Hightower, this alloy hardtail provides the confident to tackle all trail features that come along. The Chameleon geometry plays a critical role in bike behavior, and this beast is one hell of a bike you should keep if you can only own one. My Chameleon is ready for bikepacking in New Zealand! How much is the frame? What is ur height? Thanks. Yes, it is boost 29 fork. Nice bike. Did you change the dropouts to the 27.5+ version or are you riding the stock 29 version? Thanks! Thanks. I am riding on stock 29 version. how is the handling with the 140 fork? Any tire squirm with the 2.8s on the flow rims? The 140 fork handle well, playful on gnarly downhill track and climb effortlessly. The flow takes quite well on the 2.8 nobby nic, so far never experience tire squirm. How do you like the 140mm fork on there? Easy climbing?